This entry was posted in Movie Reviews - N and tagged corey stoll, Julianne Moore movies, liam neeson, Lupita Nyong'o, Non-Stop review. Bookmark the permalink. Very nice review Keith, glad you had a good time with it. When I first saw promos for it, all I could do was laugh. But I too was pleasantly surprised by the guessing game the narrative provided for most of the film. I scoffed at the ending quite a bit, but beyond that there wasn’t much to hate on here. It could have been much worse. The ending was a bit goofy wasn’t it? There were also a few corny lines of dialogue sprinkled here and there. Still it was a very good time. He really is good isn’t he. He just has that certain something that you can’t deny. Lots of fun but of course preposterous. I’m a big fan of Neeson, way back to Darkman. Oh yes. I remember him in Darkman. I really liked that movie! Good review Keith. 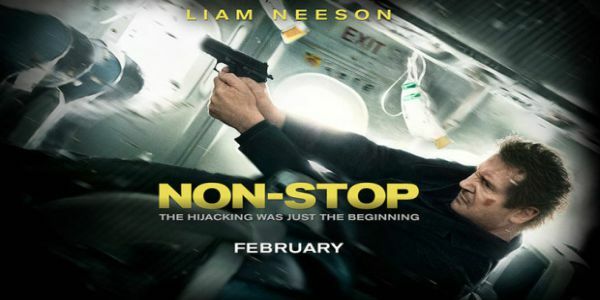 I’m fine with these types of Liam Neeson movies, just as long as they stay fun and exciting. That’s all they need to keep on doing for me to still have faith in them. Good stuff man, glad you liked it. Not sure I’ll get around to it at cinemas but I’ll definitely give it a whirl when it’s on TV. Looks like a decent bit of fun. It really is a lot of fun and the time zipped right by. It’s definitely worth catching up to. A good old-fashioned flick. Did you happen to see Taken 2? This is a big step up from it. Yeah I did see Taken 2 and thought it was terrible. It was just a cash in. Glad this is better though. I quite like the first Taken movie, but more as a rental. This one fits in that same category I think. I think I like this when I little better than the first Taken film. I definitely like it better than Taken 2! That movie just did nothing for me. Plus it had one of the goofiest moments in cinematic history. Good review Keith. Sounds like an entertainment feast. It’s a lot of fun. It has it’s goofy moments and sometimes you will be shaking your head but it’s still a good time. Excellent review! Sounds like it isn’t a bad watch, and I just may check it out sometime! It really isn’t bad at all. I have to admit it’s a little better than I expected. It’s a lot of fun and it keeps you guessing. Fun action movies are usually entertaining, so I just might check this out! Are you a fan of Liam Neeson? He is his usual awesome self in this one. It’s amazing how he has embraced these roles. But then again he’s really good in them. I do enjoy him a hell of a lot! In that case I will have to check this out. He did just sort of slip into them, but he is really, really good at it! Well you’re partly correct. The supporting players don’t really have a ton to do. But this is more of a thriller than an action film. So Neeson really doesn’t spend a lot of time running around shooting. I think that might be what I found more refreshing. It definitely has its bouts with silliness. But in the end I had a really good time with it. Give it a shot if you get a chance. Nice review. Saw it last week and thought it was enjoyable. Sure it was pretty corny at parts but Neeson does really sell the material. Glad you liked it too. Neeson definitely sells it well. At the end of the day it was just a good time. LOL. Well I do know this will never be shown as the in-flight movie. I promise you that. Thanks for checking it out. It’s actually a fun little movie. I really enjoyed this film. Much more than I expected to. It gradually builds suspense in an effective way and keeps you guessing until the end. Nice review! Thanks Mark. It was a lot more fun than I anticipated. I can really get into these types of movies as long as they’re competent and fun.